AXEL RUDI PELL Releases New Single, Lyric Video For "The Wild And The Young"
German Metal wizard AXEL RUDI PELL released a new digital single and lyric video for the song "The Wild And The Young" today. The song is taken from the current studio album Knights Call. 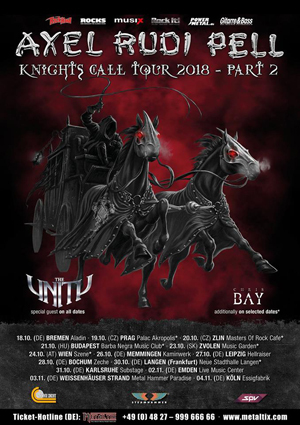 Axel Rudi Pell says: ""The Wild And The Young" is, after the intro, the opening number of our latest longplayer Knights Call and also the concert opener of our recent tour. Highly acclaimed by the fans, we will also open the second leg of our upcoming tour, which will last from October 18th till November 4th, with that track. I personally think, that this song is one of the strongest I wrote so far, very powerful and well equipped with a catchy chorus. We´re looking forward to the tour and can´t wait!" You can watch the lyric video below. The album entered the charts in Germany at #9, in Switzerland at #15 and in Austria at #26. It also charted in Sweden, Belgium, UK and the USA.